A couple of friends and I went to the east side of Oahu for a sunrise dive. 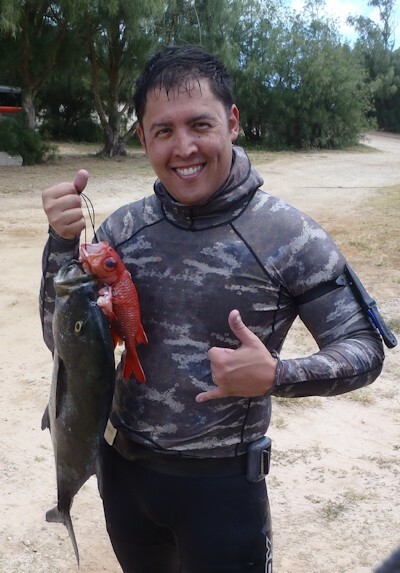 I have been wanting to practice my pole spearing skills and I knew the area we were diving has lots of caves with game. As a back up to the pole spear I brought along my Daryl Wong Pistol speargun. As the dive continued I shot a bunch of mempachi and some toau with the pole spear and was content knowing that those skills were still there. I went to my dive float and switched out to the speargun. I have been having some issues with band strength on the little gun and have been playing with different settings. Following a friends recommendation I had only one 9/16ths band cocked. ( I know this sounds like very little power but when shooting that small shaft it does the job. In the future I am going to try the set-up with just one 5/8ths and see how it compares.) So here I am stalking these two toau in about 15 feet of water. They head under a ledge. I breath up and take a drop to the side of the ledge and crawl my way around. As I look into the cave I don’t see any toau. I was a little upset that I did not see where they exited. I was about to turn around and head back up when the back of the cave moves. It scared me for a second till I realized it was an umilu. (now let me run down my set-up for you. I have one 9/16ths band cocked, triple wrapped shooting line, no reel, not tied-off to the float.) The only exit for the umilu to use was towards me and to the right. As it starts to run for the exit I take aim at its eye and shoot. Since I only had one band cocked the shaft took a slight dip and hit it in the gut. Luckily the shaft did not go all the way through. As the fish takes off it dawns on me that the gun is not tied-off. I swear this fish almost yanks it out of my hand. I hold on for dear life while pulling myself out of the cave. I am running out of air and need to take a breath. So I do something desperate. I wedge the gun in between two rocks and go up for some air. I take a couple of quick breaths and dive down for my anchor that was about 15 feet away. I unclip the tag line and swim over to the gun and clip it on. Just then the fish tugs and takes the gun into the hole with the tag line trailing. I breath up and dive down to start fighting the fish. I am not getting anywhere. Back and forth, back and forth. Now I must be lucky because my dive partner comes swimming up to me wondering what was going on. I point frantically down under the ledge. He gets the hint and takes a drop. I don’t think he expected to see what he saw under the ledge as I could see he had a bit of a startle. He went in to the cave and took a killer stone shot. After that we pulled the fish up. 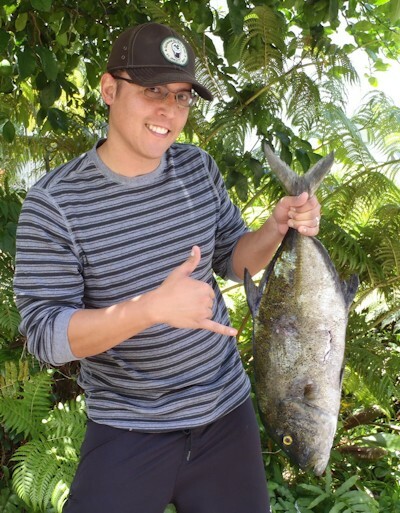 That was my first and only Ulua Umilu. Thanks Daryl for making a solid little gun that could handle all the abuse I just put it through.